The pile to scan was significant. For the life of me I could not understand what the checker’s problem was. Scan the sucker already! Come on lady just drag it over the glass. I wondered if she could work any slower. Maybe slow motion was a requirement to work at this superstore. Lady please, It doesn’t matter what kind of bag you use, just put it in a bag – please! Ugh! Where do they find these people? Cold molasses moved faster than this lady! Hiking boots with no socks. Drab gray sweats pulled up to the knees. A dirty yellow sweat shirt hid curves that were long gone. Dirty hair incased a face containing a set of dull lifeless eyes. Between the checker and the customer I could not figure out which one was more irritating. They were a perfectly matched pair. The customer’s tired eyes came up and hers met mine. A slight change – I almost missed it but there it was - pain. Curiosity swept aside my irritation. I began watching her and wondered what her story was. Maybe she was a single mom with a bunch a kids and now worn out, here she was doing her last task of the day getting some needed shopping done. Or, maybe she was homeless. Her attire fit that idea pretty well. She was having a difficult time. A simple decision of where to place each bag in the cart was a struggle. Finally, the checker finished the packing and her transaction was complete. With many unanswered questions my eyes followed her slow shuffle toward the door. My attention switched back to the checker mesmerized now by her slow methodical pace. If the eyes are truly the window into the soul, this ladies eyes screamed with exhaustion. “No, I get breaks. The problem isn’t here; it’s my 93 year old mother who lives with me. We cannot afford help so, I am her caregiver. I bathe her, fix her meals, all before this job. It is a heavy burden.” The checker’s accent was full and I am not sure of the order or what exactly followed or how the information came to be uttered but I gleaned her mother had been a great musician in her native country, maybe Sri Lanka. A smile broke across her tired face and a sparkle brightened her eyes causing them to dance. “Oh yes, I play the piano and I sing. I love music.” More was said that I did not understand but energy had replaced the doldrums in the lady. She all at once seemed younger and if I wasn’t smiling on the outside, I for sure was smiling on the inside – what a transformation in both of us! A smile and an embarrassed but grateful slight nod was my answer. She gave a simple low wave from her hip as I turned and left the store. What a change of attitude – my irritation was gone. A short connection had been made. The interchange had been no more than a minute or two but it had more value to me than the contents in my bag. Driving home I wondered how many times I miss it in my rush or my irritation. 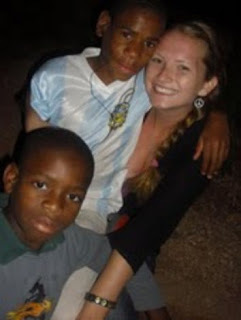 Molly Hightower died in the earthquake that hit Haiti on January 12th. She has lived in Haiti for the last 7 months. She is a person I probably would never have heard of if this tragedy had not happened. Molly was quietly working in a very unglamorous job in an orphanage which housed many handicapped children. One of her principle duties was to teach these children to swim but from her blog she is seen doing physical therapy in a variety of other areas. I was motivated to write about her for two reasons. I have a daughter who did a similar work several years ago and I can remember the fears I faced as a father the many months she was away. I can only try to imaging the pain Mr. and Mrs. Hightower are feeling this morning as I write this piece. My primary reason for this writing is so Molly’s shinning light of a life might be seen by a few others and they might be encouraged by how, good, people can be in a world where hate seems to fill the news headlines. Molly’s life of love stands in stark contrast to the hate filled lives of today’s Muslim extremist. The difference is more dramatic than the brightest day compared to the darkest night. This 22 year old girl has inspired me and I want to live better because of her story. I hope it will inspire you in the same way. Molly has a blog called 525,600 Minutes. The title says a lot about Molly and how she lived life. The blog title came from a song that asks the question, what would you do if you only had a year to live (525,600 minutes). Molly did not get all those minutes but she knew what she was about and she knew what the main point was. May her life galvanize us to focus on the main point and live life with purpose. May God bless and comfort the Hightower family in this very sad week and the weeks to come. Here is a link to Molly’s blog. She tells her own story much better than I could. When we are in pain we write – I heard someone say this once and I found it interesting and believe it to be true. I think there are probably some who write for the love of writing. I have a tendency to be a bit jealous of those people, their words flow like a feather pushed along by a soft breeze skipping here and there smoothly, almost lyrical. I started writing mostly out of boredom, wanting to improve my writing skills but I admit it was 'pain' that started the keys clicking. In an attempt to release this pain a book began to emerge and now lies hidden in a cob webbed corner of my computer. The quality of the writing was horrible but it served a purpose and maybe someday when I have retired and have learned to write and have gained some wisdom the story will be rewritten. This Christmas I compiled many of my blog posts into a book for my kids. Later I joked with a friend that my first book was a smashing success, it sold out the first day, all seven copies. As I read through my old posts I could not help notice how some of the pieces flowed along smoothly while others were disjointed and it was as if they ran sideways down a crooked trail. The smoother pieces encouraged me and the crooked ones well let’s just say I am grateful that my fellow bloggers are gentle with me when these posts have been posted. Sorry! 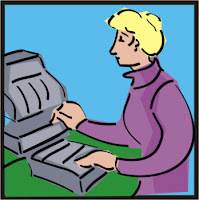 The trouble with just writing and hoping that writing alone will improve a person’s skill is kind of like the person who boasted proudly, I have twenty years experience at my trade. The trouble was he was horrible at his trade. His problem…he really only had one year experience. He repeated the 1st year 19 times. This is my 100th post and for my writing to improve my next 100 posts will not be repeats of the first 100. You can expect more risk, more failure, more openness, more success, and if I succeed I will touch your hearts and hear your laughter more often and at a greater depth. So here I sit blogging along, with hope sitting on my shoulder encouraging me. I have learned my fellow blogger friends will tell me when the words have touched their funny bone or strummed the strings of their heart; one thing is for sure their comments always encourage me. If you are reading this, thank you for coming this way, and for putting forth the effort to read to the end. I appreciate each and every one of you. If you care…you are helping me. Thanks! This is my effort in converting all you Atheists out there into being true believers. Living in modern day 2010 is simply the best! With all our amazing technological advances around us, possibly the greatest advance of all is Garbage Day! Upon arriving home tonight my first task was to roll my stuffed garbage can out to the street; a simple task that took a mere few minutes. Tomorrow, while I am at work, magic will happen, I will arrive home in the evening and shazam the garbage can will be empty. It doesn’t get much better than that. Even though this magic happens every week and I should be use to it, I am not. 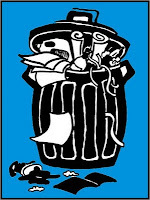 I find it a wonder that rain or shine, snow or sleet, my garbage can is empty every Tuesday when I get home. Yeah sure, if I stopped paying the bill the wonder would stop but the bill is paid and tomorrow will be an awesome day. Oh… there are those times I forget what day it is and the tub doesn’t make it to the street but that just gives me hope that somewhere some scientist has had the same problem and is diligently working in his lab solving the dilemma. Heck within the next fifty years technology will probably have advanced to the point where I won’t even have to remember garbage day. That will be like being in heaven and of course in fifty years that is exactly where I will be – now that has to make a believer smile even on his worst day. Mr. Blunt Edges, there you go, that ought to make a believer out of you, or not. HAH! Go ahead be stubborn take your garbage out for eternity.